Gold, the precious and rare metal is loved by the people of every era. 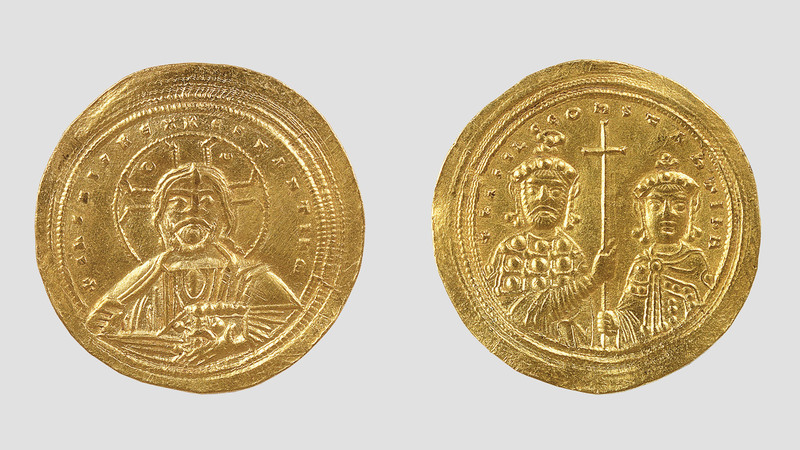 In the permanent exhibition of the Byzantine & Christian Museum, we can see a variety of golden objects and also to familiarize with episodes from the secular and the religious life of the people of Byzantine and post-Byzantine era. 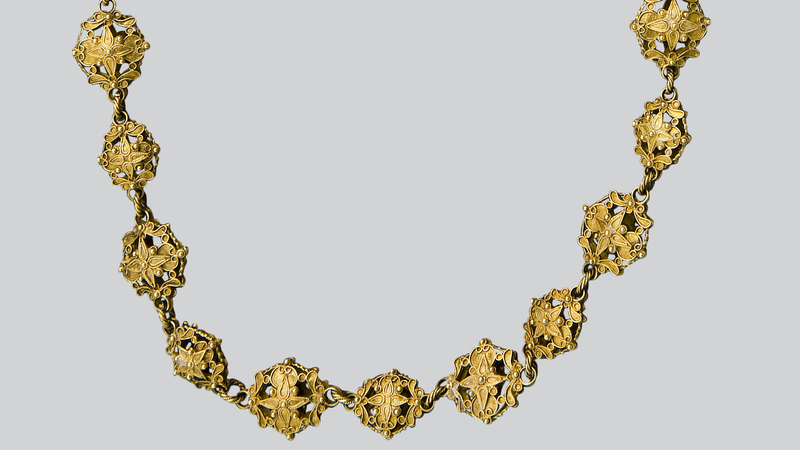 Golden chain, 6th-7th c. The treasure that was found in 1951 in Mytilene contains, among other objects, 22 golden jewels and 32 golden coins. 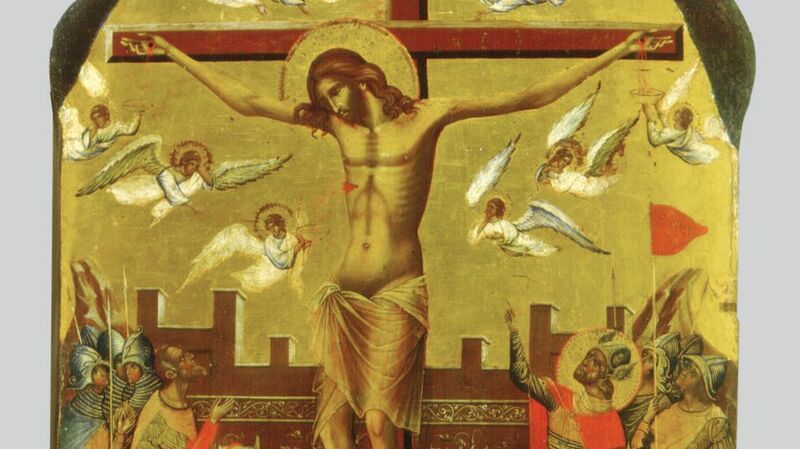 Double-sided icon, 14th c. with depictions of the Crucifixion in the one side and of the Virgin in the other. The Crucifixion is shown in gold background. 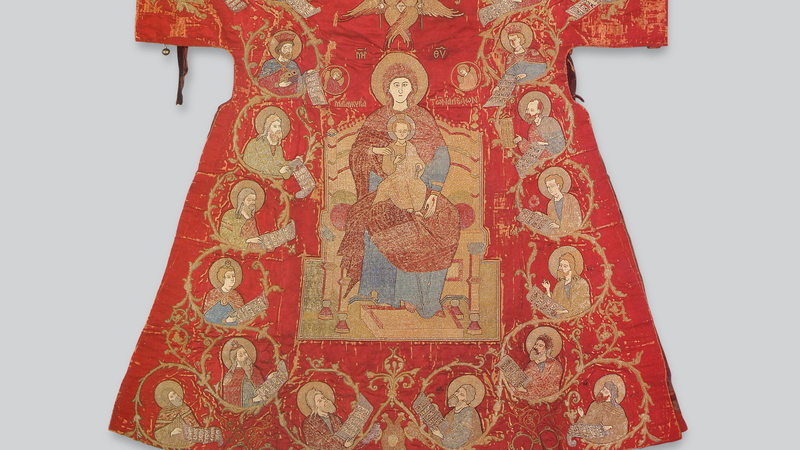 Sakkos, 17th-18th c. Ecclesiastical vestment. Gold-embroidered red silk textile. 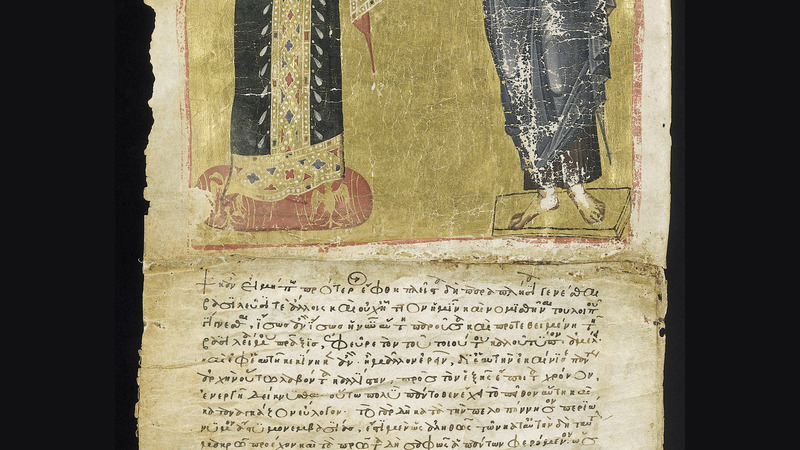 Parchment scroll containing a chrysobull of the emperor Andronikos II Palaiologos, 1301. The chrysobull was issued by Andronikos to confirm and extend a number of privileges that he had granted in the past to Nikolaos, the metropolitan bishop of Monemvasia. 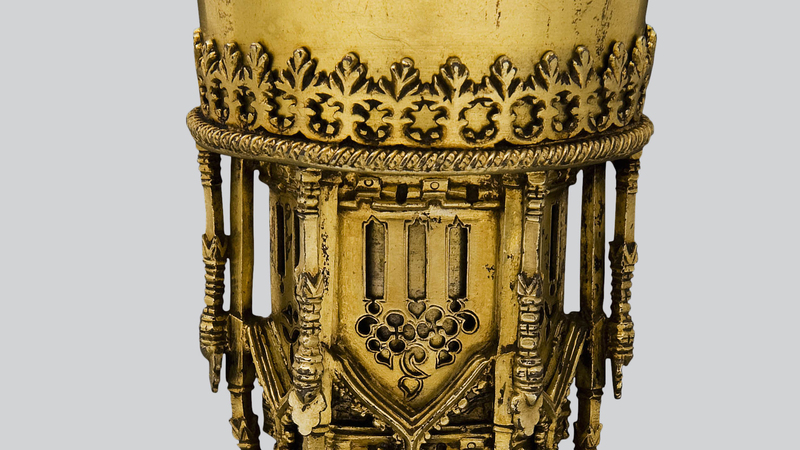 Chrysobulls were imperial documents that bore the emperor’s signature in red ink and a gold seal (chryse boulla). Gold was important for the embellishment of women as well as of men. The gold jewellery was indicative of the economic and social status of the owner, and of his family. The jewellery was a sort of investment, which was passed from generation to generation. The most common female jewellery is the earrings; the rings and necklaces follow. The custom of men to wear jewellery is dictated not only by love for the precious, but also by the tendency to show their social status or wealth. 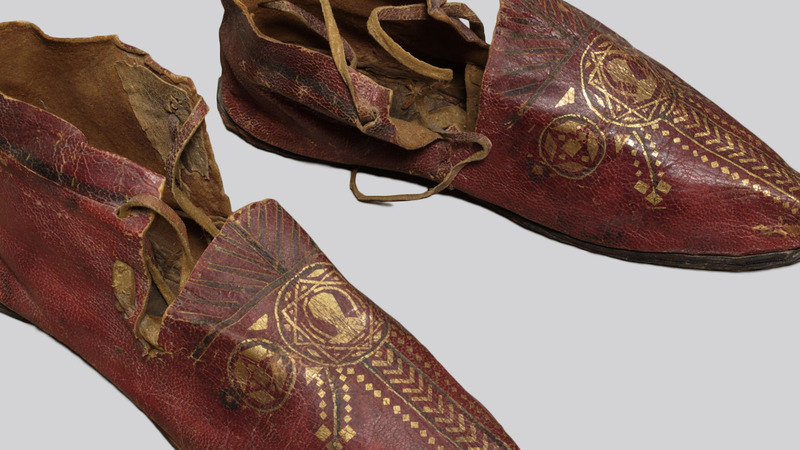 They decorate their costumes with gold jewellery and wear shoes made by gold tooling leather. 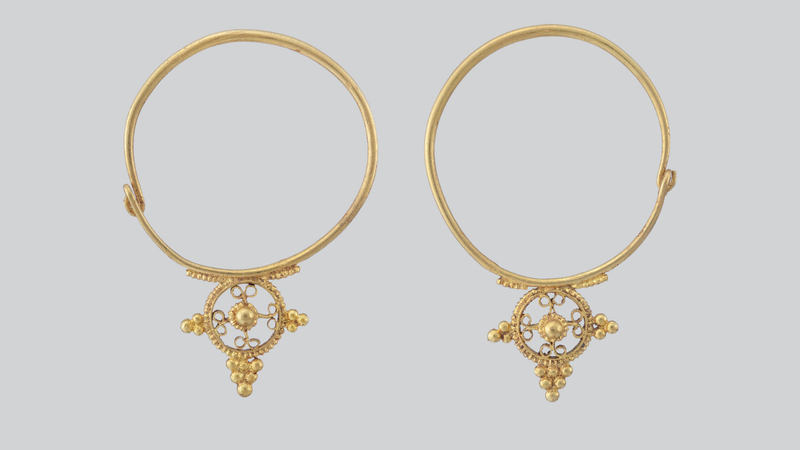 Golden elaborated earings. 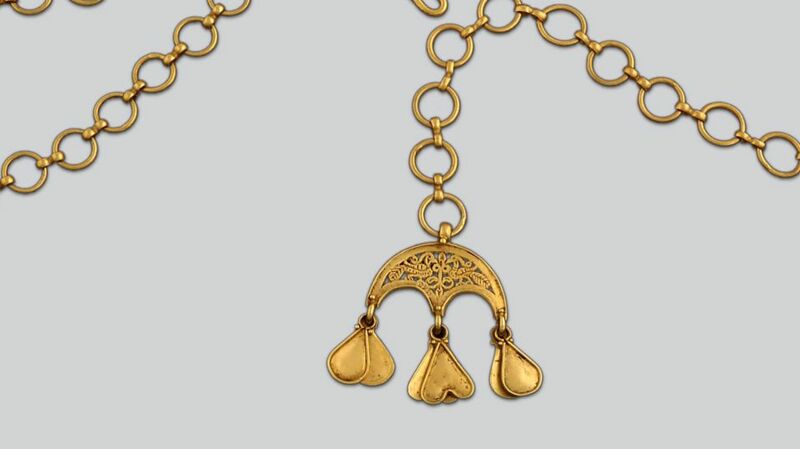 6th-7th c.
Golden necklace. 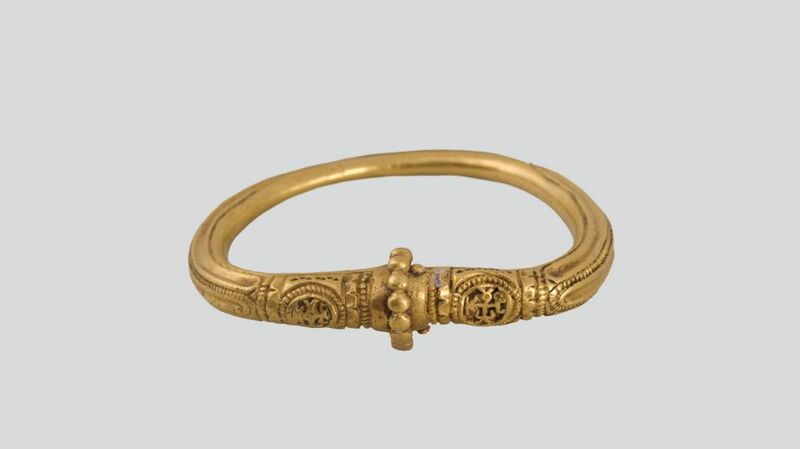 Late 17th-early 18th c.
Golden bracelet from the Kratigos of Mytilene Treasure. 6th-7th c. The double monogram could probably be rendered as Cyril, son of Georgios. The small diameter suggests that the bracelet probably belonged to a young boy. 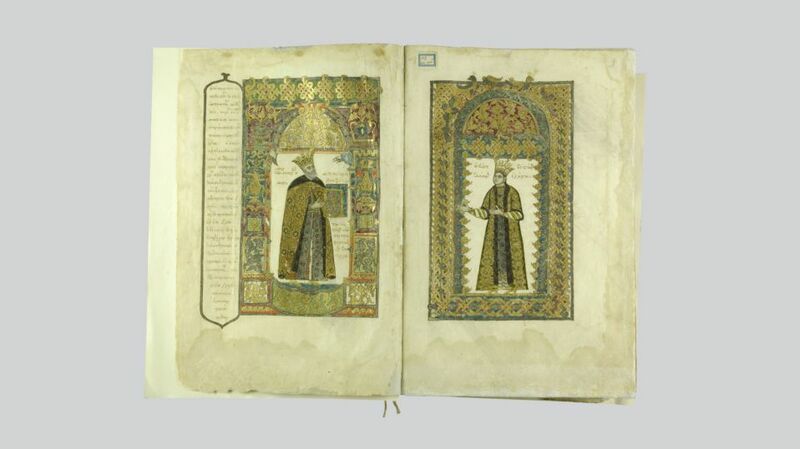 Miniatures from a luxurious illuminated manuscript (1644) from the Monastery of Virgin Petritziotissa, Bachkovo, Eastern Rumelia. 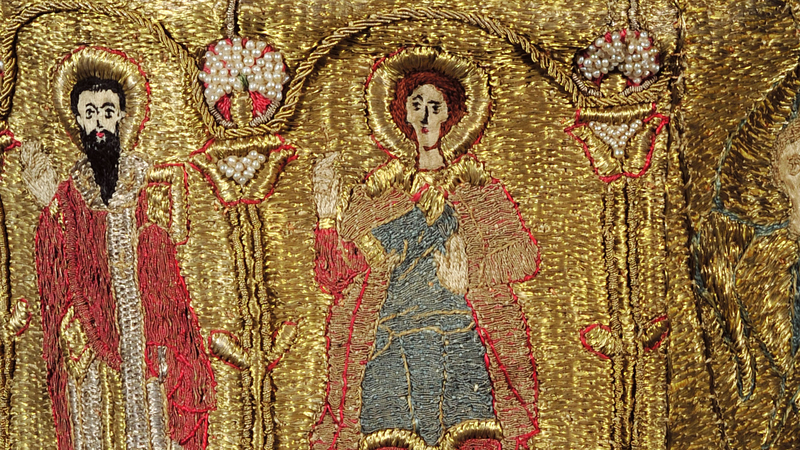 The Donors (ff.2-3) in gold-embroidered costumes are the voyvod of Wallachia John Matthew Bassaraba and his wife Domna Elina. 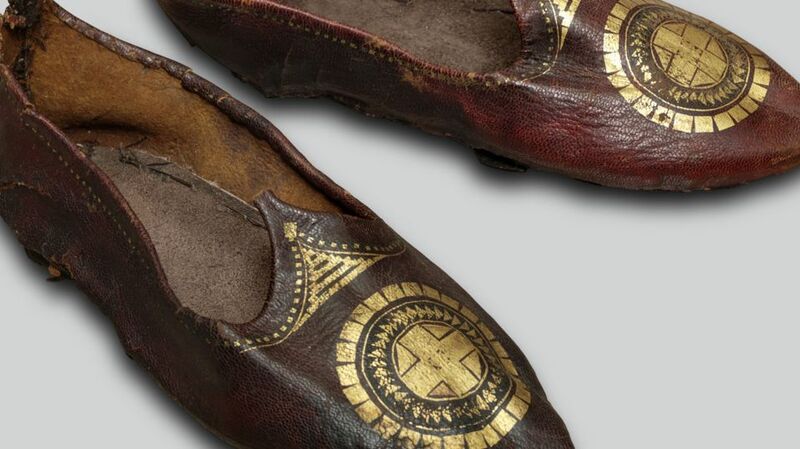 Leather shoes decorated with gold leaf. 5th-8th c.
For their everyday financial transactions the Byzantines used the Byzantine gold coin, which was also a means of expression of the imperial ideology and power: the image of the emperor is presented on it. 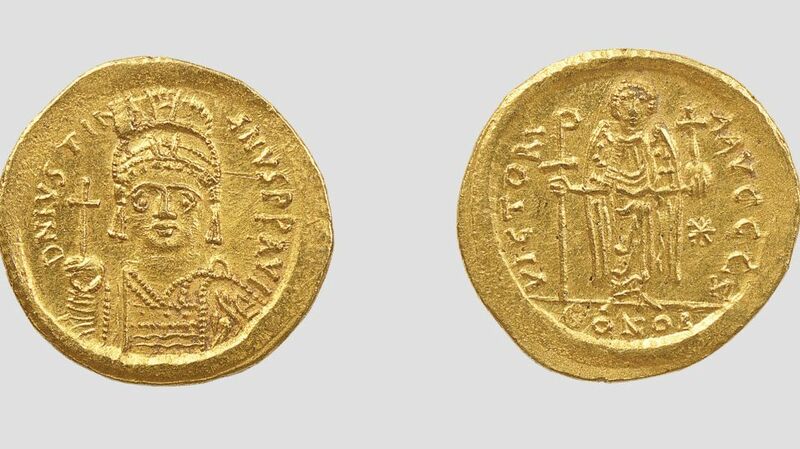 Solidus (gold coin) of the Byzantine Emperor Justinian I (527-565). 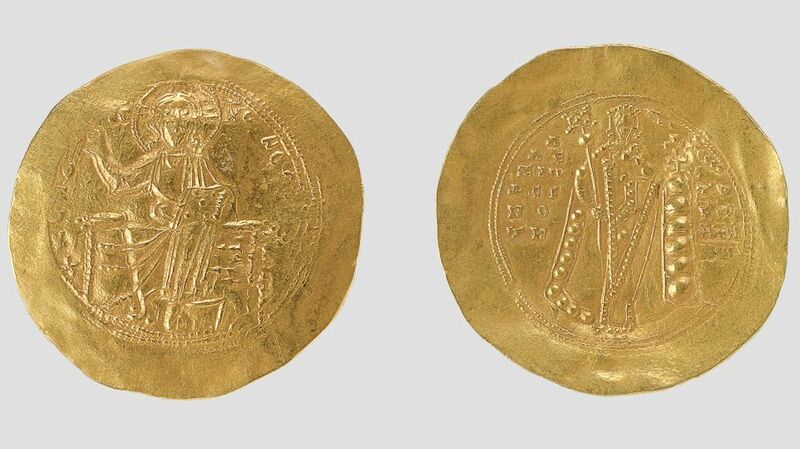 Histamenon (gold coin) of the Byzantine Emperor Basil II (976-1025). 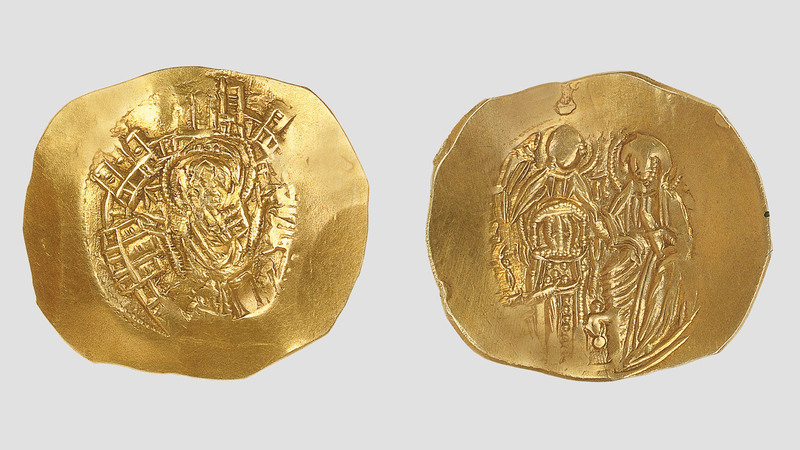 Hyperpyron (gold coin) of the Byzantine Emperor Alexios I Komnenos (1081-1118). Hyperpyron (gold coin) of the Byzantine Emperor Michael VIII Palaiologos (1258-1282). In Christianity gold is identified with the "ultimate" good, the eternal-immortal “Logos”, the perfection and therefore with Christ. It is used in art as background in the scenes depicted on portable icons, and also in wall paintings and manuscripts in order to express the transcendental and to symbolize the divine light and the heavenly kingdom. For the same reason Christians choose gold to make the sacred vessels of their churches or to adorn the vestments of their priests. Virgin Episkepsis. 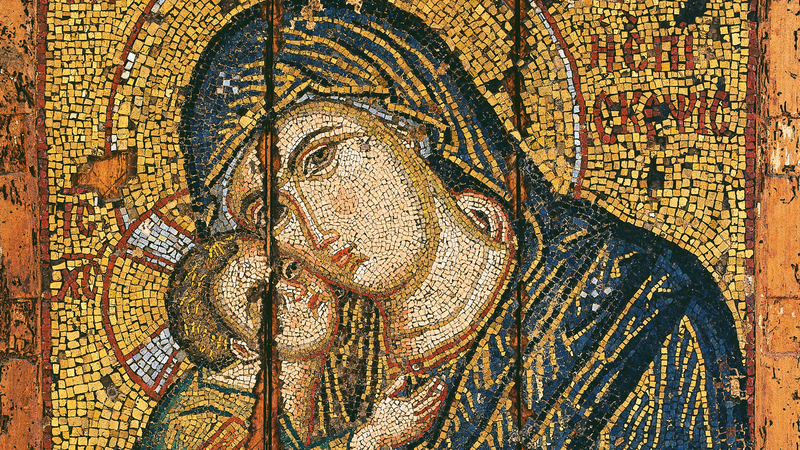 Mosaic icon with the Virgin and Child. Late 13th c. From Triglia, Bithynia, Asia Minor. This particular type of the Virgin, in which the two faces are touching, cheek to cheek, is known as the Glykophilousa. This type presents the Virgin in her capacity as mother, while at the same time emphasizing her role as protector of mankind. Gold plated silver chalice. 1632. 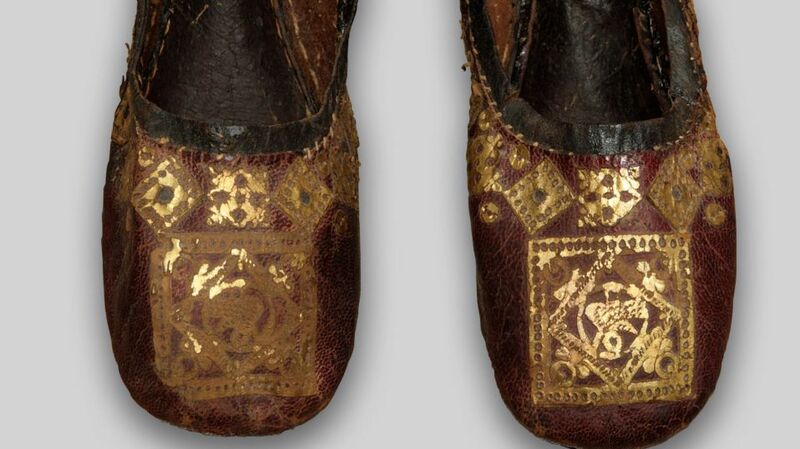 Made by Cseh Gyorgy (1625-1685). 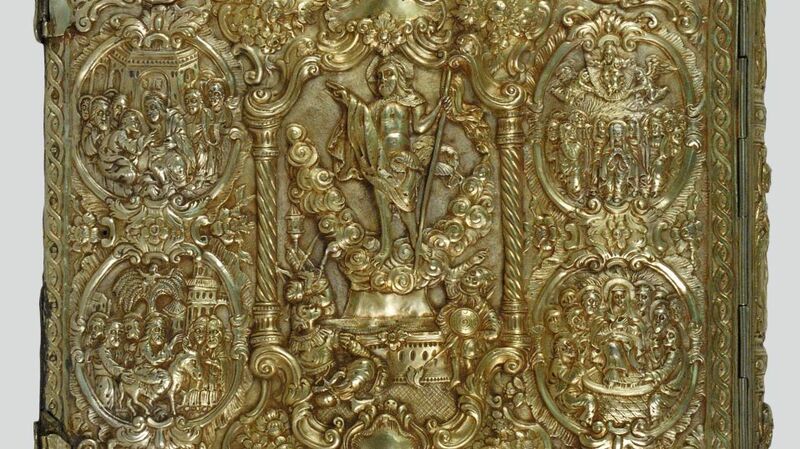 Gold plated silver Gospel cover. From Ainos, 19th c. (the book is dated in 1780). Gold-plated wooden carved iconostasis. Late 17th-18th c.
Provenance: Sinope, Pontos Dimensions: 22 cm (diam.) Gold embroidered Mitre (head cover of a senior member of the clergy). 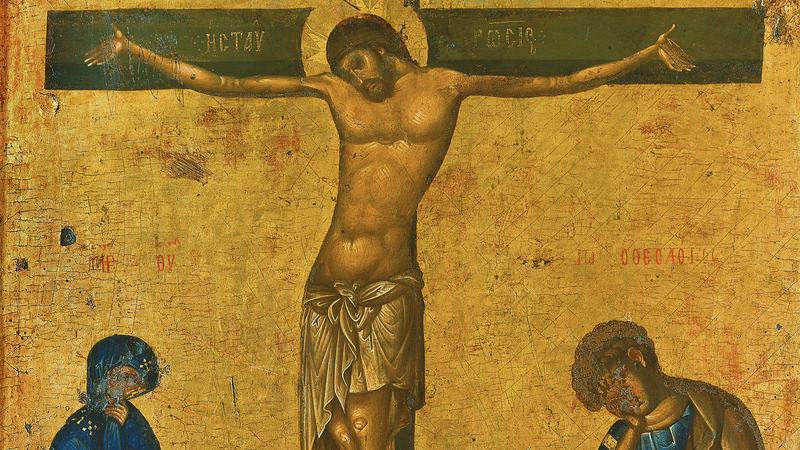 The Crucifixion in golden background. 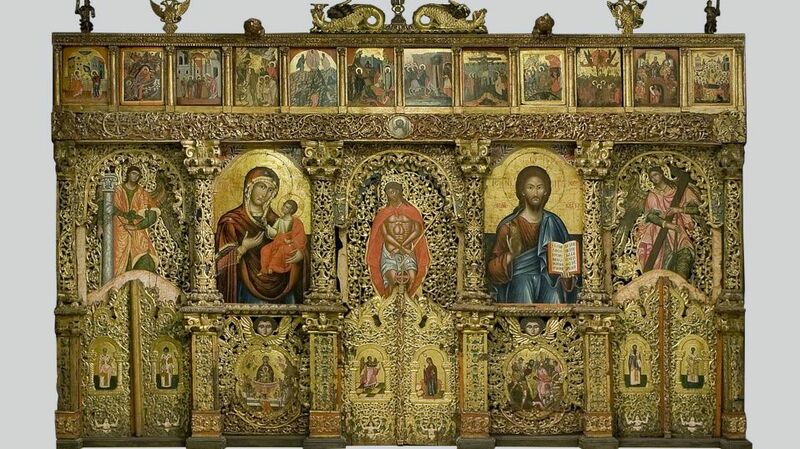 Portable icon, 14th c. Painted by Paolo Veneziano.